In my last post, I wrote about using a different kind of light in the painting just underway, which made me think about the different ways light has appeared throughout the history of painting. Of course, without light there is no vision and no depiction of the world, but each period of art and each artist approaches its use with different aims. Through much of the Renaissance, form was bathed in an even light, coming from upper left or right, and this clear light-to-dark of each object gave it weight and a position in space. In early Renaissance panel paintings, shown in this post, the form doesn't achieve the full volume of later artists such as Raphael or Michelangelo, but light in these works often has a spiritual dimension. 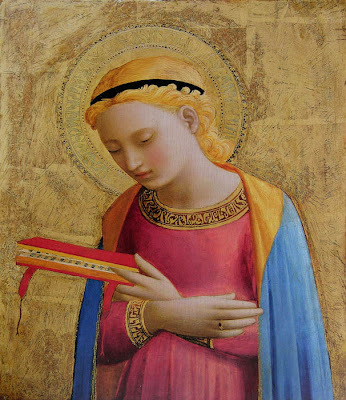 In the Fra Angelico above, the Virgin is shown in a soft light that seems to emanate from her figure. The use of gold leaf in the background intensifies this feeling. When we move into the late 16th and 17th century, light becomes a subject in itself, as with the paintings of Caravaggio, with their strong single sources of light that partially illuminate the scene, while throwing much of it into shadow. 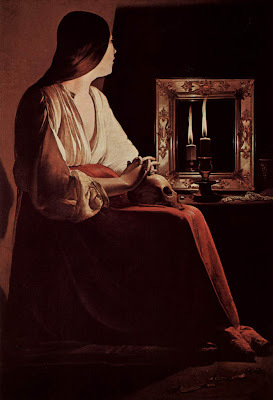 This drama is made more intimate in the works of de La Tour, who often has a candle as light source within the painting. I imagine de La Tour enjoying the challenge of depicting the specific quality of candlelight and its effect on objects and flesh. The mood in this painting––quiet, enclosed, thoughtful, isolated––makes us think of spirit, but in such a different way from the Fra Angelico. It's almost as if Magdalene is alone in her faith, while the Virgin is enveloped by a larger presence. 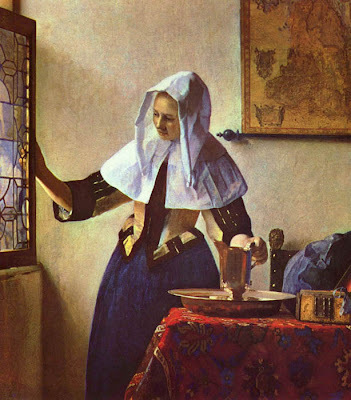 With Vermeer, and other Dutch painters of the 17th century, light comes from a source indicated within the painting, a window or a door. Very different from the dramatic light in a Caravaggio, which illuminates a narrative, the daylight shows a mundane scene of everyday life. Each ordinary object, however, is transformed by light and clarity of form into a marvel of creation that we contemplate with deep pleasure. 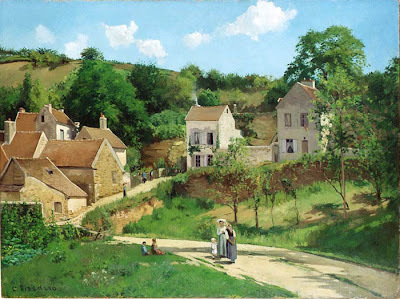 In the Impressionist landscape paintings of the late 19th century, real, visible sunlight becomes a primary subject as it shines on land and figure and building. Light had for so long been generalized that's it's surprising to see the freshness of color and light in these works. In American landscape paintings of the 19th century, such as those of Fitz Hugh Lane, light is all encompassing, not specific, an idea rather than a fact; this style was later called "Luminism". "Impressionism" was more about the eye and the fleeting effects of light, made even more vivid in the later paintings of Monet. Within the sweep of 20th century painting, abstraction has been the primary mode of expression, which might seem to discount the use of light. I'd argue, however, that light is embedded within color and for a painting to be successful it must have life, and therefore light. I'm giving myself an easy example by choosing Matisse to illustrate this point, whose paintings, whether figurative or abstract, are drenched in the light of southern France. I've paired the Matisse painting with a Persian miniature that is remarkably similar in its linear composition. 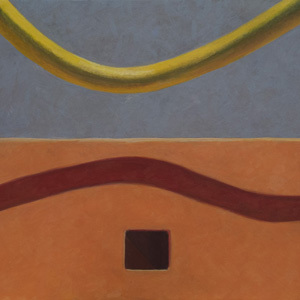 Both paintings use line to sensitively surround the flat forms, giving them an illusion of fullness. 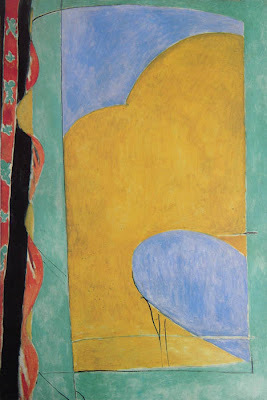 Both have a quality of light coming from the color itself, though in the Matisse this is enhanced by the use of transparency. The works illustrated are just a tiny taste of the variations in light used to make form, and as subject. We each see the world a bit differently, so the way we use light in our work must be richly varied. But none of us can do without it. thanks for this, Altoon. it was a nice interlude, considering light in the midst of an overcast afternoon. it would be interesting to stroll through the Met considering light though the ages. 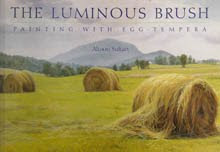 Lovely lesson on light....you have so much to offer and you do, Altoon. The Pizarro was especially fine to see again, and how you spoke of color holding light in abstract works...I like that thinking. I saw the Melendez exhibition at LACMA (Los Angeles) today. The paintings are impressive in their depiction of texture - fruit, wood, pottery, and the reflections of light on grapes for instance are dutifully included, but the works rarely spring to life. It's as if there was no real light source, and the still lifes appear dead. I had the same impression of the Arts and Crafts furniture and pottery which are normally very pleasing: sturdiness, lack of freedom. Then suddenly in another room stood the actual pottery of George Ohr, gleaming, churning, entirely alive. This impression was echoed by a Tintoretto, a Titian and a Veronese with their allegories and fiction - colorful and full of light, burst out of the box. I appreciate the comments. One thing I love about doing this blog is the way it gets my mind meandering in interesting ways. Linda, that's interesting about the Melendez. I love much of Spanish still life painting; I haven't seen much Melendez in "person", but have liked a couple of the paintings where objects seem to be bursting out of the picture plane. I'll be seeing the show this winter in Boston and will likely write about it then. I'll keep your comment in mind. Thank you for this posting, Altoon. I have a theory that the history of art divides between periods of seeing color shapes (Persian, Japanese, Sienese, early Renaissance, Fauvism) and seeing value shapes (Mannerism, Dutch landscape and figure, Barbizon school). True, pure color has value--but strong values (based on light and shadow) bleache and obscure color. It seems to me that at some point, painters make a choice--or maybe it's an inbred affinity for one or the other--whether they are more interested in working with light and shadow, or with color. Susan, interesting idea that makes much sense; color as primary focus does seem to fade the stronger the value structure. I have in my mind the linear vs painterly version of that theory, stuck there since grad school after reading Wolfflin's "Principles of Art History". Such an appropriate posting for me since I am in Lisbon and it environs enjoying their history. In some of the ancient convents and palaces we visited (Tomar, Sintra, Obidos) the paintings are in such need of restoration the orignal light has been cast with black shadows. 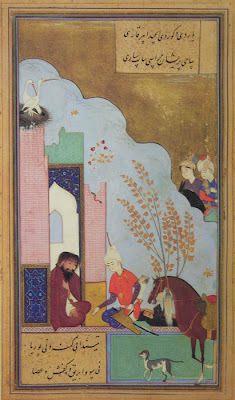 But seeing some of this work in its orginal settings is quite remarkable.